If you sell merchandise that is normally given in celebrations such as weddings, then it is important to be able to handle a Gift Registry. XpertMart™ lets you setup a gift registry of the gifts someone would like to recieve for their special ocassion. XpertMart™ will keep track of what is registered as gifts, let you sell these items and then keep track of what has already been purchases as gifts and what is still pending. The gift registry has no payment detail information as it is just a list of things people can buy for this event. You should be sure to enter the Ship To information as this is whom the gifts will be shipped or delivered to. 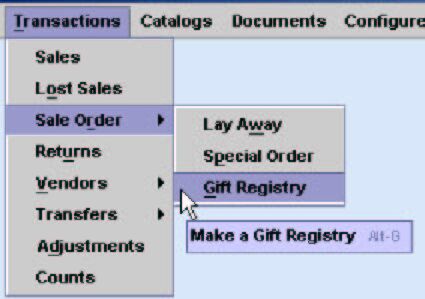 XpertMart™ automatically puts the Gift Registry number in the reference field of the Invoice as you can see here. From this point on you proceed exactly as you would with any other sale. You can put in the customer's information so you know who bought the gift. You add the payment information as a normal sale. You do not have to finish this sale, nor sell all the items on the Invoice. You can exit from the sale, delete items or change quantities. If you finalize the sale then XpertMart™ will take the items bought on this invoice and show them as bought on the sales order that originally opened this sales window. NOTE: Once the sales window is open you can close the Gift Registry window if you wish. 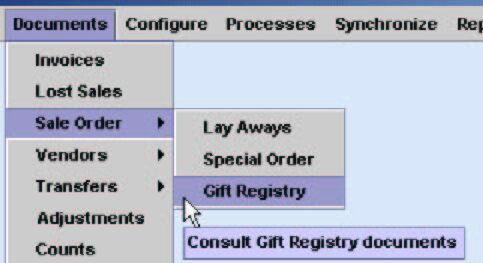 Once the sale is made you will have to refresh the query on the Gift Registry if you still have it open to see the changes in the Sold and Pending columns.